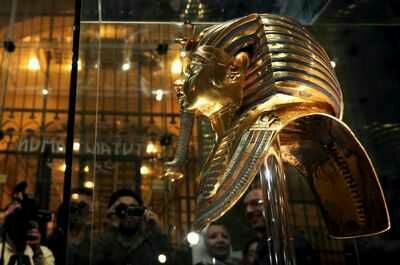 Eight museum workers face trial for allegedly botching a repair to the priceless 3,300-year-old gold death mask of the pharaoh Tutankhamun. The group – which includes a former director and the ex-director of restoration – are accused of using “inappropriate” glue to stick the beard back on. Officials at the Egyptian Museum, in Cairo, have been ­investigating for a year, after the blue and gold braided protrusion mysteriously became detached. Officials have been investigating the incident for more than a year and the accused now face charges of negligence and violating professional standards, Egyptian media reported. The ancient artefact is one of Cairo’s biggest tourist attractions. Conservators at the museum had given differing accounts of the circumstances of the beard becoming detached. One suggestion was that it had been knocked off accidentally while a bulb was being replaced in the display case. Another theory is that it had been removed after becoming loose. In all, they made four attempts to reattach the beard, on the later three occasions also allegedly trying to remove evidence of their earlier failed efforts scraping off excess glue with metal tools. The accused deny the allegations. Tutankhamun’s golden face mask weighs 24lbs and measures 21 inches in height and 15 incheswide. The workmanship is quite exquisite and its value is priceless.It is made of gold inlaid with semi-precious stones, coloured glass paste and the eyes are made with obsidian and quartz. The back of the mask is engraved with a series of spells and texts from the Book of the Dead. The mask was placed directly on the mummy of King Tut inside the third coffin housed in his sarcophagus. The mask depicts the boy king wearing the traditional false beard of the pharaoh. Beards were considered to be sacred to the gods and therefore the pharaohs. The bizarre false beards were tightly knotted and plaited and hooked behind the ears. The beard on the King Tut mask is a long, narrow beard plaited like a pigtail with the end jutting forward.